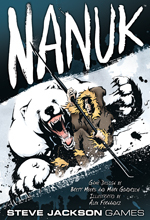 We sent early copies of Nanuk out to several of our elite volunteer squads, to show off this highly social game. Here's what a few of them had to say. Phil's a bit hurt that Nanuk is stealing the "Loudest Game We Publish" crown away from Frag Gold Edition. But since he found Nanuk while it was still being developed by Brett Myers and Mark Goadrich, he only has himself to blame.